Certain medical vaccines and drugs need to be kept at specific temperatures in order to be usable and effective. Therefore it is essential that these medicines are kept in reliable pharmacy fridges or cold stores in order to remain safe and viable. There is a wide variety of medical inventory that needs to be stored in a temperature controlled environment. These include vaccines, diagnostic kits and blood samples. All of these items must be guaranteed to be safely and reliably stored. Fail safe back-up is important within medical cold storage units, so that if the temperature control equipment fails there is always a back-up in place. This is why pharmacy fridge stores often contain two independent refrigeration units for full critical redundancy. Having two independent refrigeration units guarantees that if one fails the other will then take its place, providing unbeatable protection for valuable medical inventory or any other pharmacy items placed inside. Easy control of temperatures is also essential, so modern refrigerated equipment has features to allow the levels to be checked remotely via an internet connection. A quality pharmaceutical cold store will also have a temperature control panel to allow accurate setting on site. For storage of large amounts of medical items there are walk in temperature controlled units available. These storage units have safety features including phone-in or out sight and sound alarm systems. Kill switches and lock stops are also installed for the peace of mind. 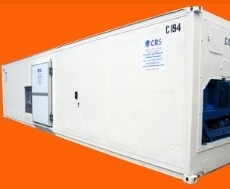 So safe storage of medical inventory is guaranteed with modern pharmacy fridges and cold stores. This means medical practitioners can have peace of mind that their vaccines and other medicines are reliably stored ready for distribution and use.